5.0 (Based on 13 Reviews) 100% of reviewers recommended this product. This is a well made prism diagonal that works well with my home-built 75mm f/5 refractor telescope- with the fast focal ratio there is some noticeable CA but only at higher magnifications - I use the scope for low to medium power views primarily on open clusters and the diagonal works great and makes observing more enjoyable compared to a straight thru view. Waiting for a few years to get one of these. Excellent product and performance. Little or no scatter from the prism, crisp precise voews. The helical fine focus adjustment is a nice touch. bought this a few weeks ago and as below, mine was screwed down pretty tight as well but came loose with some elbow grease. the first thing I noticed about this prism diagonal in comparison to my dielectric was that the diffraction rings during collimation of the scope are much more clearly defined - it's like they were drawn with ballpoint pen! doubles that I had trouble splitting are now more clear and DSO's have new definition. I was a bit hesitant with the price being what it was but have decided it was worth the extra money over other diagonals. highly recommended! I've very impressed with the build quality and versatility of this diagonal. I've swapped out the 1-1/4" nosepiece with the Baader Deluxe Short (15mm) SCT Female to T2 Male T-Adapter # T2-21 2408160 for use with my C8. 5.0 Great build, fast arrival, SCREWED DOWN TIGHT. It's a beautiful little diagonal, clear optics, nice to see Jupiter through. Arrived very quickly and well-packed. BUT, the focusing ring was screwed down wicked tight and wouldn't budge at first. I almost reached for pliers after Agena reassured me that I had purchased the right one, but Agena and Cloudy Nights came through and suggested pushing on the lock screw and keeping at it then suddenly it moved like nothing was ever wrong. So buy with confidence. This is the finest prism diagonal I've ever used...better than any dielectric prism I've used too. Highly recommended. 5.0 Top quality prism diagonal. Decades ago even some of the best telescopes came with rather generic prism diagonals. They were nothing like this. This Baader piece is well made of high quality materials, tolerances, optics and coatings for a component that is a joy to use. The fine focus feature is great, especially for planetary viewing. The first night I received mine, I viewed Jupiter with an older Celestron SCT and saw great detail, color and contrast. I haven't yet compared it to my usual dielectric mirror diagonals, which I look forward to doing. 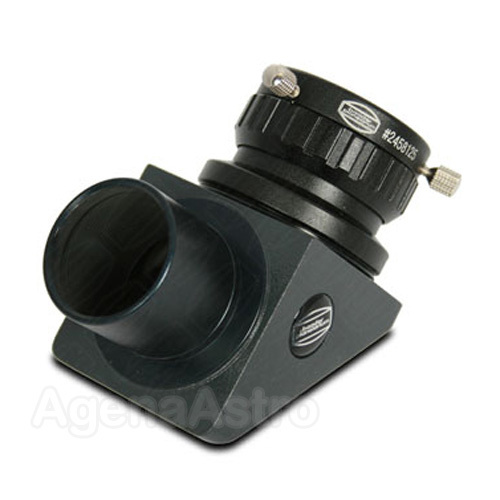 Very solidly constructed 1.25" prism diagonal, with the bonus of having an integral helical focuser for the eyepiece. Prefer this over the Tak 1.25" prism diagonal, similar quality or better prism, but all-metal housing unlike the Tak. Great quality glass and coatings and very tight construction, a pleasure to use! Review by AhBok of 40 miles north of Graceland!. If you have a C8 or smaller SCT and use a focal reducer, this is, IMO, the best diagonal you can get. Why? A quality 1.25" prism diagonal gives you the shortest path to the eyepiece focal plane of any diagonal. This prevents the vignetting that necessarily occurs as the focal train on the SCT gets longer. If you want zero aperture reduction due to increasing the focal path of the C8 and smaller, by keeping the image train short, then the Baader prism diagonal and the optional SCT adapter is the best solution I have seen. Review by Mike in Kentucky of Frankfort, KY. I bought this prism diagonal to view planets through my 102mm f/9.8 refractor. It was a great purchase! Not only does it provide excellent views, but the focusable eyepiece holder allows me to fine focus after using the telescope focuser. My experience is that this prism diagonal works better on planets than my dielectric mirror diagonal.